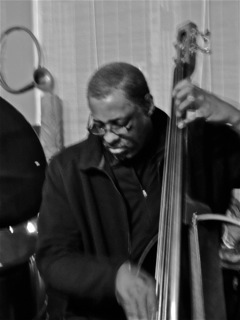 Larry Roland, poet, bassist, composer, educator, and music producer, has been involved with the creative performance scene for close to 4 decades. His music and poetry has graced National and International Concert Halls, Radio, Television, the Internet; as well as, parks, street corners, outdoor theaters and private living rooms. Larry graduated from Boston University in 73' with a BS in Education, and a Masters from the University of Massachusetts in 97'. His poetry career began at BU, and his Bass discovery started in 76' while running a coffee house in the south end of Boston. Larry has had a wealth of experiences as a performer and a producer. The following is a highlight of some of the activities he's been involved with from 'then' till 'now'. From 74-84' Larry performed as Poet and Bassist with Jamyll Jones, " Worlds Experience Orchestra". That group recorded two albums, "The Beginning of a New Birth" and "As Time Flows On", which are today considered collectors items. (You Tube). In 84-88', house band at Wally’s in Boston. Wally’s is a very popular establishment where the Established, as well as, the young cutting edge musicians from the surrounding formidable music schools (Berklee, N.E. Conservatory, etc.) cut their teeth before moving on to NYC, and other places. In 89', Larry was invited Perform with the Raphe' Malik band, and went on the road performing throughout the east coast, Canada and Europe from 91-94'. This band recorded "21st Century Texts"...Live in Berlin in 91' on the FMP lable; Raphe' was a fiery free improvisationalist trumpet player and composer who had been in the Great Cecil Taylor Unit Bands with Jimmy Lyons for several years. Other albums recorded with this group were, "Bells, Whistles, AND Sirens", on the Mapleshade label in the early 90s; and in 99', "Looking East", recorded live by the Boxholder label at the Museum of Contemporary Art in Boston, Ma. In 96', Larry struck up a musical collaboration and formed the "Urge 4Tet" with Donel Fox, a noted Award Winning Pianist and contemporary classical composer; and Waldron Ricks, a talented trumpeter/composer; and developed a repertoire consisting of originals and non-originals, then set out and toured Southern France in the summer of 97'; The concerts on that tour were recorded, and the CD of that tour, "21st. Century Decisions" on the Boston Composers Group Label, was released it in 2000. 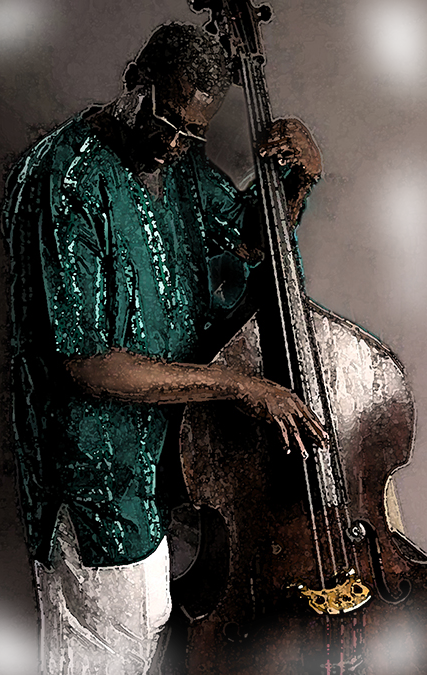 In 2001, Larry released the solo bass and word CD, "As Time Flows On", on his Boston Composer Group Label. One of the pieces on that CD, "The Underground"(Bass with Poetry), was used as a interweaving theme in the Award Winning Indie film documentary, "The History of Jazz In Roxbury" by Taliba Kennedy. In 2004', Larry met Award Winning Dancer/Choreographer, Adrienne Hawkins, and decided to team up with her after she had been using the CD, "As Time Flows On", for live performances at Dance Festivals and other functions. Out of this collaboration, "Bassline Motion" was created. At first, Larry and Adrienne performed together as a duet, then eventually increased the group to include, 4 musicians and 8 dancers. They both decided on a Theme, while Larry developed the music and poetry, as Adrienne created the movements to ride the music, and to compliment the words. "Bassline Motion" performed in museums, outdoor festivals, universities, art galleries, jazz clubs, poetry gatherings, etc. 2009, Charles Gayle, a highly noted saxophonist on the NY and International Jazz improvisational scene, invited Larry to perform at a major Jazz Festival in Mexico City. .....it turned out to be very successful. In 2010, the trio toured Portugal and the Azores. In the winter of 2012, one of the coldest in European memory, the same trio was involved in a 10-city tour that took them through the countries of France, Austria, Belgium, and Germany. In March of 2011', and after not having recorded in over 10 years, The Charles Gayle Trio released a CD entitled, "Streets". It is said to be one of the top selling CDs of its genre on the European scene. Currently, Larry is involve with several different projects of his own while writing poetry and music in preparation to present some more of his documented work to whoever will watch and listen in the 21st century.